We were asked to conserve an antique picture frame for an Historical Society here in Maine. The frame was what local antique dealers refer to as “Lemon Gold.” It is silver gilt from the mid 19th c. which then has a “vermeil” or gold glaze applied over the silver leaf. The frame arrived with the ubiquitous layer of radiator paint applied to the whole thing and, since it was painted over about 100 years ago the radiator paint was a lovely shade of dark grey green. We removed the paint, surveyed the surface losses, made all repairs, and gilded with silver leaf all losses to the leaf. I always have on hand old frame samples for color matching. I tested some glazes then toned the frame to harmonize with another antique sample I have in the studio. I even took a very fine paint brush and added in the “age spots” these Lemon Gold frames get from when the original shellac has worn through and exposes the silver to the air which then oxidizes. 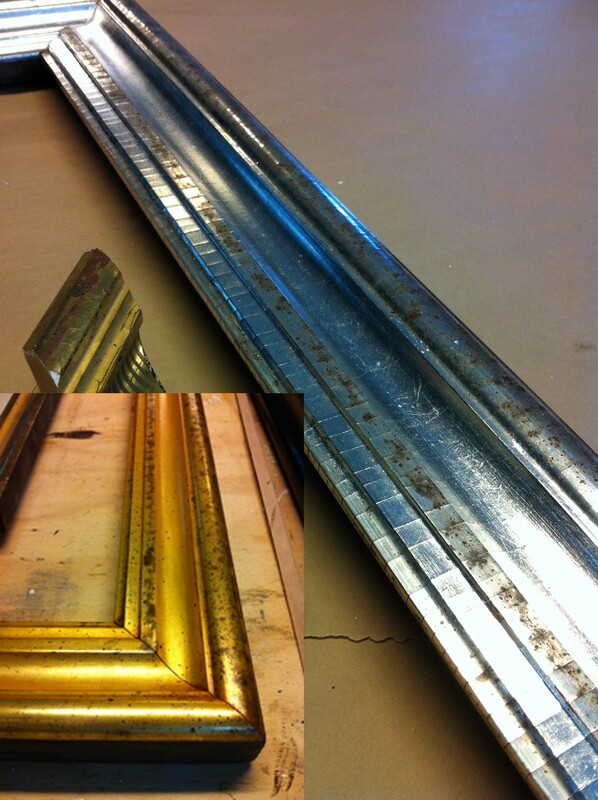 This image shows the silver gilt frame before and after (inset) our conservation efforts.